I remember 10th grade keyboarding class in high school, which was a required course for everyone. I’ve typed a lot more characters than I ever expected in the days since, but I’ve been wondering how much longer people would be typing, or at least typing on a physical device intended just for typing. I’ve tried the “sliding” method of typing on my phone, with limited results. Hunt and peck still seems to work better for me, and I’m getting less “big finger” errors on my phone’s small virtual keyboard. The picture above is from the “Bain Collection” at the US Library of Congress Prints and Photographs Reading Room. 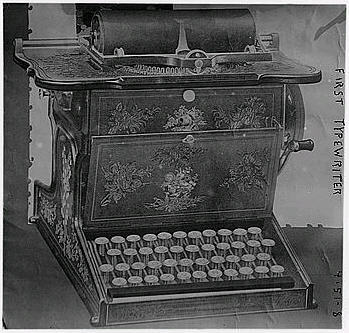 I’m not sure if it’s really the very first typewriter, but that’s what’s printed on the image, and that’s what the Library of Congress is calling it. The Bain Collection contains images from one of the earliest news picture agencies. 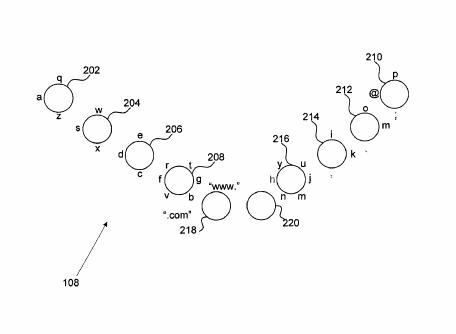 While looking through the pending patents from this week, I came across this patent filing for a touch screen keyboard, from Google. Are we seeing the last days of physical keyboards approaching? A system, method and computer-readable medium for using a touch-screen keyboard. A keyboard operation module generates geometric shapes for display on a touch-screen display, each geometric shape corresponding to a respective finger of a user. Each geometric shape includes characters at predefined locations around the perimeter of the geometric shape. The keyboard operation module detects a sliding movement of a finger in contact with the touch-screen display from inside a geometric shape and toward the perimeter of the geometric shape. 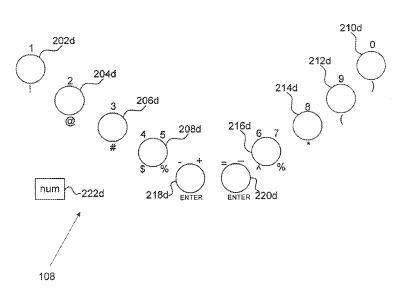 The keyboard operation module then determines that the sliding movement is in the direction of a particular character positioned around the perimeter of the geometric shape and selects the particular character for display in a text entry area of the touch-screen display. Would this be utilized for mobile and tablets, primarily? “Are we seeing the last days of physical keyboards approaching?” I think we were long overdue on this. Implementation onto mobile an tablets would be most convenient, but what’s interesting to see is how they’re going to do the same on laptops and desktops. I don’t know that I could ever imagine it. Sure, on an iPhone or iPad it makes sense, as it saves a ton of room on the device for the screen. But on a desktop — which I’m currently typing on — I’m much more comfortable hacking away at these physical keys. Clearly in the mobile field we’ve basically already hit that point, but for desktops, I just don’t see it. Hello, I think the way things are going now, we will probably be using speech in the future, but it is amazing how we have gone from big typewriter to today’s technology..Who would’ve thought! I agree with Michael, it would seem very weird typing on a desktop touch pad but hey a few years ago it would have been weird reading a book an a kindle so it may be easy to get used to it.